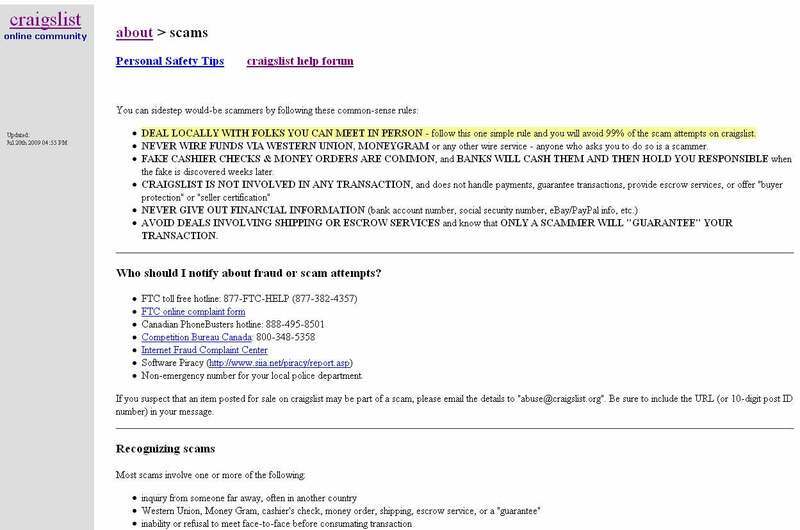 Given everything from the "Craigslist killer" to Connecticut attorney general Richard Blumenthal's campaign against the site to the escalating battle over prostitution ads, you'd have to live under a rock to miss Craigslist's sensational presence in the media. Lost in the discussions of illicit or criminal activity, though, are the everyday scams--and every category on the site has them. The site offers simple and straightforward advice on how to avoid would-be scammers. To be fair, the highly popular site offers very rational advice on how to recognize and avoid scams. But scammers persist in part because Craigslist is such a go-to place all over the world and partly because victims apparently don't heed the aforementioned advice. Below we present a few of the scam classics. Make sure you don't become one of these poor schmucks. Here's how it works: The scammer contacts you and offers to buy your brown corduroy couch… oh, except they're out of town and will send you a check. When you "accidentally" receive a check for a much larger amount, they reasonably ask you to wire back the extra money--possibly even offering to pay a little extra for the inconvenience. But when the bank determines that the original check is a fake, guess who is responsible for the balance? Employment scams on Craigslist are all kinds of questionable, but they also seem blatantly obvious. What is the likelihood that someone will pay you $900 per week to telecommute as a "documentation professional" with no experience necessary? Yet, the jobs section is well known for tricking otherwise intelligent people into unfortunate situations. Two of the most common ploys are to ask for up-front training fees and to solicit personal information (often via a legitimate-looking Website) for "direct deposit" or "background check" purposes. In a truly off-the-wall case, one guy hoodwinked 79 professionals into working for weeks on a sham project. Promising a $21,000 salary for two months worth of work, the charlatan set up a fake company, hired the group via e-mail, assigned seemingly real work, and tricked a lot of people into giving up their time and personal information. It seems the entire effort was undertaken in the hopes of getting a woman's attention. Despite thousands of legitimate postings for free stuff on Craigslist, there have also been two recorded instances of crowds ransacking all of a person's worldly belongings. Why? Somebody posted an ad to the "Free" section claiming that the goods were there for the taking. In 2007, the angry daughter of an evicted tenant carried out this particularly nasty revenge. An even more bizarre incident occurred a year later in rural Oregon. A woman unknown to the victim, Robert Salisbury, robbed him of a few saddles and then panicked. In a (profoundly stupid) attempt to cover her tracks, the thief posted a message declaring all possessions at Salisbury's address were up for grabs. Even his horse. Anyone found in possession of stolen items is subject to criminal prosecution--as were the perpetrators of both hoaxes, who were caught and charged with a medley of crimes that included burglary, criminal impersonation, and malicious mischief. The lesson: Just because it says so on Craigslist, it doesn't mean you can rob people. Be wary of catch-all posts that seem too good to be true. Also, don't piss anyone off who knows your address. Last year, the Center for Disease Control and Prevention (CDC) issued an official warning about a swindle that one site has informally dubbed the Cameroon Pet Scam, explaining, "Typically, the person offering the animal for adoption lives in another country and claims to be looking for a good home for the animal. Victims pay shipping fees up front but never receive the animal." Another con involves supposedly "rescuing" dogs or cats, often from an animal shelter, and then selling them for a profit on the site. According to one account, a family put their dog up for a free adoption directly via Craigslist. The very next day, they got a call from a woman who had purchased the dog for a $100 fee (also via the site) but then tracked down the original owners after noticing discrepancies on the veterinary papers. The crimes we've mentioned are hardly limited to Craigslist alone, but the epicenter of the world's online classified ads also has the following security ethos: "Simplicity and shame work best." According to Newmark, the most effective tools are warnings and flagging posts for removal. And scammers know it. After witnessing a group of strangers trucking away his personal belongings, beleaguered homeowner Salisbury commented, "They honestly thought that because it appeared on the Internet it was true. It boggles the mind."